Houma Rotary - About Rotary - What Is Rotary? Rotary club membership represents a cross-section of the commu-nity's business and professional men and women. The world's Rotary clubs meet weekly and are nonpolitical, nonreligious, and open to all cultures, races, and creeds. The main objective of Rotary is service — in the community, in the workplace, and throughout the world. Rotarians develop community service projects that address many of today's most critical issues, such as children at risk, poverty and hunger, the environment, illiteracy, and violence. They also support programs for youth, edu-cational opportunities and international exchanges for students, teachers, and other professionals, and vocational and career devel-opment. The Rotary motto is Service Above Self. Although Rotary clubs develop autonomous service programs, all Rotarians worldwide are united in a campaign for the global eradi-cation of polio. To be effective, a Rotary club needs members. A club’s ability to serve the community, support The Rotary Foundation, and develop leaders capable of serving beyond the club level is directly related to the strength and size of the club’s membership. Club leadership teams and club members, particularly the membership committee, should assist with membership development and responsibilities. A club’s membership development action plan must incorporate strategies for recruitment, retention, and organizing new clubs. The service projects committee should carry out educational, humanitarian, and vocational projects that address the needs of a club’s community and communities in other countries. The service projects committee as one of the five standing committees. Clubs may amend its bylaws to reflect the specific responsibilities of this committee, adding sub-committees as needed. Rotarians who have a strong knowledge of the community, as well as community volunteer experience, should be appointed to the service projects committee. The President-elect works with the Service Projects Committee to determine whether current club projects will continue into the coming year. 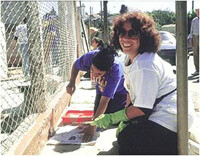 Incorporate continuing service projects as you set your goals. Rotarians and friends of the Foundation who share the vision of a better world. Public relations is essential to Rotary’s future. It informs communities around the world that Rotary is a credible organization that meets real needs. It also motivates Rotarians to be active members of their club and district. Every Rotary club should develop and implement a successful public relations plan to be effective in the community. The plan can take many forms, from promotion of a Youth Exchange student in the club bulletin to newspaper coverage of a club project impacting the local community. Regardless of the cultural differences from onecountry to another, all Rotary clubs have audiences that they should communicatewith. A club leadership team and club members, particularly the club public relations committee, should develop and implement the public relations plan. and Rotarian involvement. This committee structure focuses on the central functions of a club and can be expanded to address club service goals and fellowship.